Tim Horton’s chipotle steak wraps are absolutely one of the worst dishes I’ve ever tasted. I ordered it at the drive-through, which took an incredibly long time to prepare. Looking at the staff through the drive-through window, they were in a state of disarray and complete disorganization. This is probably due to the fact that Tim Horton’s menu is overly complicated and poorly executed at the best of times. On a side note, I don’t know how you can state “always fresh” with frozen food. In their defense, I suppose, this refers to their coffee. Anyway, I was handed my chipotle steak wrap in a cardboard container with the sauce and dribbling out all over my car and clothes. Once I open the cardboard container, there was an overwhelming burnen smell. This, I assume, was due to the fact that their toaster was probably on the wrong setting. The filling, including the steak, was bland and lacked seasoning. Although I didn’t try the chicken chipotle, I assume there would be much difference. 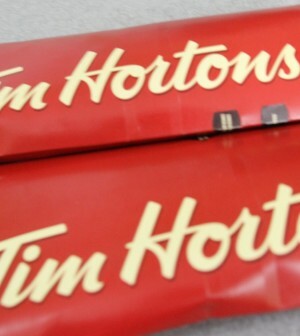 Again, as with most Tim Horton’s products, and epic failure.